To say that working at—and ultimately leading—the Chicago Board of Trade is a family affair for the Carey family is an understatement. While it has merged with the Chicago Mercantile Exchange (CME) and gone public, WIU alumnus Charles Carey '75 was the third generation of Careys to serve at its helm. 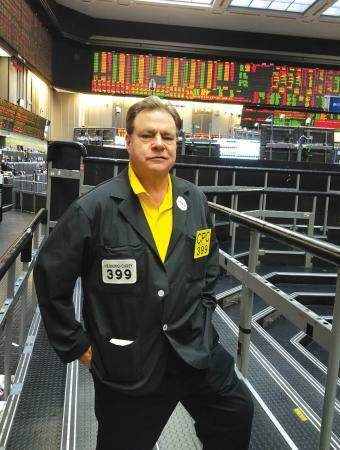 Carey has spent the last 40 years in the trading business … a job he was destined to have. The Carey legacy began more than a century ago. Carey's great grandfather immigrated to the United States from Ireland and worked as a blacksmith. It was his son who started the Carey legacy at the Chicago Board of Trade. He started his career as a clerk at a trading firm, which led to a job as a grain trader, that then allowed him to purchase his membership at the Chicago Board of Trade in 1910. He briefly left due to price controls but came back to the Board as trading was making a comeback after World War I. That was a tumultuous time for the markets as the Great Depression hit. And when the stock markets collapsed, that dramatically affected Board of Trade memberships. Carey said that a membership in 1929 was around $64,000, "which was a lot of money back then." In 1933, seats could be purchased for as low as $3,000. The next generation saw two Careys at the Chicago Board of Trade—Carey's father was a grain trader who joined the Board in 1948, and his uncle also had a seat and would follow in Carey's grandfather's footsteps by serving as chair of the Board in the 1960s. Charles Carey started trading in January 1976 for MidAmerica Commodity, a mere few months after he left WIU. He joined the Chicago Board of Trade in April 1978, where he remains a member today. He has accomplished a lot over the past four decades, and attributes much of that success to his alma mater. An Illinois native, Carey grew up on the south side of Chicago and graduated from Oak Park River Forest high school. He first heard of WIU from John Passananti '75, who was planning to go to WIU to play football. He heard of the business school's good reputation, so Carey figured it would be a good place to attend college and pursue a business degree. "The campus was growing; they were adding classes and growing the physical plant to meet the needs of the students," Carey said. Carey's lessons weren't just in the classroom. As a member of the WIU football team, he soaked up as much as he could from his coaches, Pete Rodriguez and Darrell Mudra. From learning about leadership to communication, Carey's time on the football team was just as valuable as the time he spent in his business classes, especially when it came to Coach Brodie Westen. "Any time I go to Macomb, I try to see Brodie," said Carey. "It's nice because he is family, and it's like having my own family there. He's the guy we went to war with every Saturday. He saw the highs and the lows, and the relationship was so strong, particularly with his offensive linemen, but his players, they all loved Brodie. There's no doubt about it. And he made a difference in people's lives. He had that strong positive influence that you remember. He was a hard driver and a winner, and that's what young men need and respect." Along with his football involvement, Carey also pledged the Phi Sig fraternity. With football practice, weight training and fraternity activities, he kept a busy schedule. He paid his bills by working at the Tennessee Tap and for Denny Moon at Walt's Office, but Carey said his academics were always a priority and left a big mark on him. "You remember some of the teachers, and some of the corny stuff they would say stuck with me and makes more sense now that I'm as old as I am," Carey said. "I had some great teachers. I remember Norm Walzer, an economics teacher, and Ed Sims … Potter. I can't remember the name of the professor I took statistics with, but he made it understandable. He was a good teacher." One particular assignment sticks out in Carey's mind. He remembers writing a paper on The Chicago Board of Options Exchange, which opened in 1973 when he was a student. "I remember doing a paper on it for one of my classes on standardized options and how revolutionary it was at the time," Carey recalled. "When I was coming out of school and going into this industry, it really was the beginning of the golden age of trading. The world just got smaller due to technology. The satellites, technology, communications—who would have thought you could trade from a cell phone halfway around the world. And now we are all virtually equal because we can sit here and trade electronically, and the speeds are so fast with fiber optics and microwaves. We're connected all over the world; there's no big disadvantage." After graduating from WIU, Carey took a job at a construction company in Chicago and started saving money to purchase his own seat at the Board. In 1978, he started his first trading job at MidAmerica and made that purchase. "I had no idea when I was leaving Macomb that August that I'd be in this industry 40 years later," shared Carey. And while his education prepared him for the work world, it was a combination of that and the guidance from his family that set him on the path for success as a trader. "I learned from my father who was a trader, and I learned from other traders and by being exposed to it," Carey added. "The formal education was helpful, but stepping into this world, it was completely different. You can't really prepare somebody." A little over 20 years into his trading career, Carey was first elected to the Board of Directors at the Chicago Board of Trade in 1990. He ran for chair in 1994 and lost. After a short hiatus from the Board, he again ran for a seat on the Board and was elected. At that time, he was nominated to be the vice chair at a time he called "very contentious." That did not scare him from serving in a leadership position, and in 2003, he was elected chair of the Chicago Board of Trade, a position he held through two terms until it became a public company in 2005. During his tenure, he saw the industry change completely. What once was done by traders standing on the floor day in and day out can now be done with the click of a button on a computer or mobile device. "Back in the old days, everybody who made a living that way did so in person … standing there all day. It was a young man's game. At my age, I could probably go down and do some trading—and I did, until we started side-by-side trading in 2006. By 2008 or 2009, the screen had kind of taken over most of the business. You had to be down there with a laptop in your hand. It used to be, you stood in the crowd and you did your trade and I do miss that. You miss the camaraderie, the people," he said. The Chicago Board of Trade was a member-owned organization for 155 years, and Carey was at the helm when it went public. He said that it all came about due to a contentious battle with their own clearinghouse that had lost control and had a different agenda from the Board, which was their only customer. "This should be a business class study for current Western students," he laughed. The Chicago Board of Trade left after the clearinghouse went rogue, which was the first step of the merger between the Chicago Board of Trade and the Chicago Mercantile Exchange, Carey explained. When he started as chair of the Chicago Board of Trade, membership was around $300,000. At the end of his term, some seats were worth up to $8 million. In October 2005, they went public, which was a big change for Carey, whose family had been a part of the Chicago Board of Trade since 1903. "I approached it strictly from a business standpoint. I was never emotional about it. This is business. And I took my business classes at Western, so I knew what business was," said Carey. "It's amazing how you see bad decisions come from what are supposed to be smart people. We sowed the seeds of this type of situation in the 90s because we didn't control our own platform. We kind of fought off electronic trading; we didn't embrace it, and we didn't control our clearing corporation and they went hostile on us. Those were the biggest things that led me to believe that a merger would be the best thing." When the two entities merged, Carey became the vice chair of the combined group, serving for three years. He remains on the board today, and his job entails not only a lot more technology, but a lot more interaction with global partners. Carey frequently travels to Brazil for business and has ventured to Russia as they provided the CME with their electronic trading platform. Aside from work, Carey and his wife, Linda, have three sons. Their oldest decided to follow in his dad's footsteps and now works in Brazil for a smaller cash grain broker. When his son told him that he wanted to be in the business, Carey told him the business had undergone a lot of change with computers and computer science. "Algorithmic trading has kind of taken over what we did," Carey explained. "We used to do that face-to-face, but that has all changed. I told him Brazil and China, over the next 50 years—that's where your growth opportunity is. They were growing 40-50 million tons of soybeans in 2004, when I first visited Brazil. Today, I think they'll grow 117 million tons. The U.S. will always be a force in agriculture, but with the amount of land and the opportunity for expansion, those are key areas." Away from work and his family, Carey has been recognized for his civic and professional success. In 2007, he received the WIU Distinguished Alumni Award for his business and professional accomplishments. He has also been awarded the Rerum Novarum Award from St. Joseph College Seminary, Ellis Island Medal of Honor from the National Ethnic Coalition of Organizations Foundation, Inc. and the Gold Medallion Award from the International Visitors Center of Chicago. He also serves as president of the Chicagoland Sports Hall of Fame. Despite a busy calendar, Carey still finds time to return to his alma mater. He attributes much of his success to Western, adding a number of people from his era accomplished just as much as him, both personally and professionally. "We've had some great success stories … John Passananti, Dave Lumley '76 and Bob Nardelli '71 … just to name a few," Carey said. "These guys found the right opportunity, and they came in and realized they were just as competent as anybody from the Ivy League—anybody from any big school. That's probably one of the biggest reasons I am proud of Western … of how many alumni have been successful in business and whatever field they chose. Western has to take some of that credit because they spent some time there."